The Delhi Government in accordance with the DSSSB has released the official notification for 9232 vacancies in DSSSB online application form 2018. The cloud over the exact timing of the release is still not clear as the DSSSB is finalizing the blueprint of the DSSSB online application form 2018. Meanwhile, we bring to you some expected date sheet for the recruitment of the teachers. In the following article about the DSSSB Teachers Recruitment 2018 Important Dates, check the dates related to the DSSSB Selection Procedure. The candidates will have to fill the application form and pay the application fee. The candidates will not be given extra time to fill the application form. The candidates will require filling the form by visiting the official website. Here the candidates will have the option of selection of their posts as well as the number of posts they want to fill in. The application form will be available for an entire month. It will release in both online as well as the offline format. Please wait for the official notification to come and we will update all the information as soon as possible. 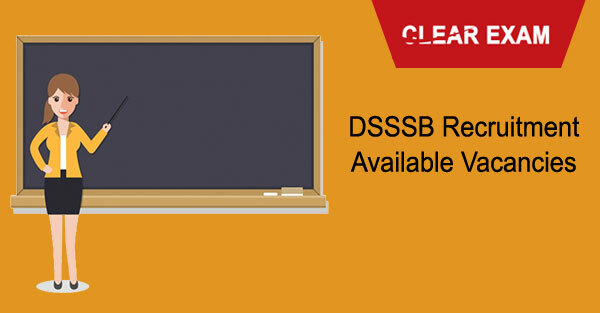 Candidates should go through the Important Dates of DSSSB Exam. The applicants need to visit the DSSSB official website to fill the Application form. After filling the Application form, the candidates are required to pay the application fee. In the following article about the DSSSB Teachers Application form 2018, we have mentioned all the important information about the Application form for the DSSSB Teacher Recruitment as well as the process to be undertaken while filling the Application Form. The Photograph should be a recent passport size & colored and must not be three months old. The photograph must be made on white background. Caps, hats and goggles are not acceptable. Religious headwear is allowed but it should not cover your face. Dimensions of the photograph should be 100 x 120 pixels (preferred). The candidates have to sign on white paper with black ball pen. Dimensions 140 x 60 pixels (preferred). Size of file should be between 5Kb to 12Kb. Signature in capital letter shall not be accepted. The candidates will need to visit the official website of DSSSB to fill their application form. After filling the application form, they will need to pay the application fee. For the whole process, candidates have to first register themselves on the official website of DSSSB. The amount of the Application fee has to pay by the challan. Once you are done with the application form, you will receive an Application Number which you need to preserve for the future purposes. The candidates will need to visit the official website of DSSSB. We will also host the direct link for the help of the applicants. On the website, click on the notification concerning the Teachers Recruitment 2018. On the next page, furnish all the information asked in the application form. Then upload a recent passport size photograph and signature in the format specified above. Take a print out of the Application form and safely keep it.